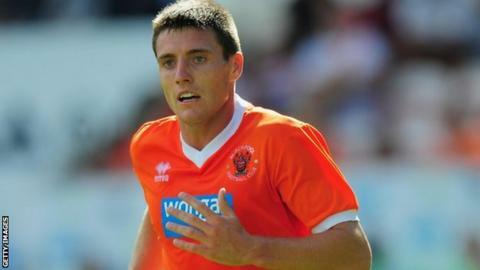 Shrewsbury Town have signed striker Bobby Grant from Championship strugglers Blackpool on a month's loan in a bid to end their goal shortage. Town have slipped to 12th in League Two, largely as a result of having scored just twice in eight matches. Grant, 24, has not found the net since leaving Rochdale for Blackpool in the summer of 2013, including one game on loan at Fleetwood last season. But he had a healthy scoring record at both Rochdale and Accrington Stanley. "I can score goals at this level," Grant told BBC Radio Shropshire. "I've proved that throughout my career. "I can't wait to get started now. For myself, it's about getting out there and playing." The Liverpudlian, who started his career at Liverpool, hit 18 in a season for Stanley under John Coleman in 2009-10, earning him a move to Scunthorpe. Shrewsbury have scored just two goals in their last three home games - and have not found the net in more than seven and a half hours of football away from home since winning at Leicester in the League Cup on 26 August. Bobby Grant has a career tally of 51 goals in 207 appearances for Accrington, Scunthorpe, Rochdale, Blackpool and Fleetwood. After two lean years with the Iron, culminating in a loan move back to Accrington, Grant scored 16 times for Rochdale when Coleman took him to Spotland in the summer of 2012. He was then signed by Paul Ince for Blackpool in the summer of 2013, but played just seven games for the Seasiders last term and has not figured for them since last December. Grant's signing maintains the link between Town manager Micky Mellon and chief executive Matt Williams with their former club. Four of Shrewsbury's 18 signings since the end of last season - Mark Halstead, James Caton, Scott Vernon and Andy Mangan - also had previous spells at Blackpool.